I’ve been meaning to get this recipe posted for all of my followers who showed an interest when I posted the preview! Was that over a week ago now? I apologize. Time seems to have gotten away from me this week. I was a bit preoccupied with the election and everything that’s happening in the news, but I’m back now and ready to cook, and photograph, and blog, and talk to all of you! Be happy, be safe, and be kind. Anyhoo, here’s the recipe. It’s actually my husband’s. He’s such a good cook, and I’m so appreciative when he decides to cook a meal and give me a little mini vacation from the kitchen. As much as I love cooking, blogging, and creating recipes, it’s a treat when someone else cooks a meal for me. This chicken! It’s so good! And the recipe is pretty straight forward. 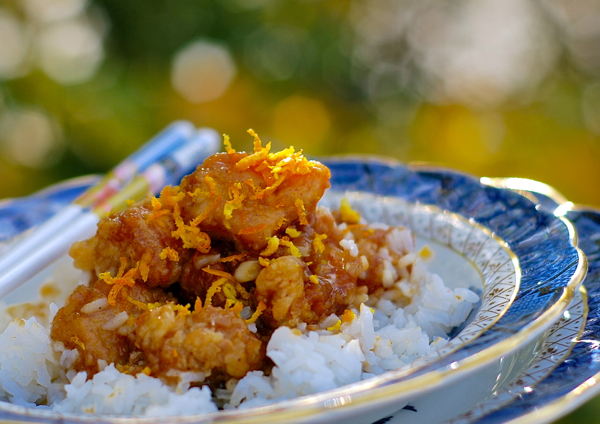 Add a little honey to the final dish if you like your orange chicken a bit sweeter and stickier. Cook all, except water, cornstarch, and half the zest, over medium heat until sugar is dissolved and sauce is slightly reduced. Mix water and cornstarch in a small bowl until completely combined and smooth. Add to simmering sauce, and stir until thickened. Add a little more water, if needed. Remove from heat and set aside. Cover to keep warm. Place beaten eggs in a shallow bowl. Mix flour and cornstarch together, and place them on a plate. Dry chicken pieces using a paper towel. Dip in egg and then dredge in flour/cornstarch mixture. Place in one layer on a cutting board until ready to fry. Heat peanut oil, one inch deep, in a large, heavy skillet until shimmering. Fry chicken in batches, flipping half way through, until cooked all the way through and golden brown (approximately 2 to 3 minutes per side.) Transfer to paper towel-lined plates. Once all the chicken is cooked. Reheat sauce if necessary. Toss sauce with chicken pieces in a big mixing bowl. Add honey, to taste, if using. Serve over cooked rice or Chinese noodles, and garnish with any or all of the following: the rest of the orange zest, sliced green onion, peanuts, soy sauce, and hot sauce. Serve with steamed or stir fried veggies, if you wish.